Some Clackamas residents who have a weak or broken tooth may want to research dental crowns as a solution to improve their smile and overall oral health. A crown is really a cap or covering that is tooth-shaped and when it is in place, it will cover the portion of the covered tooth that is above the gum line. 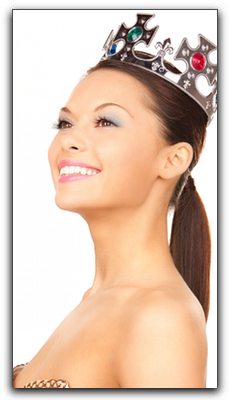 Crowns can be made of metals, resin, ceramic, porcelain, or a porcelain-fused-to-metal material. Your Clackamas area dentist will usually put in a temporary crown while a permanent crown is being created especially for your mouth in a dental laboratory. Dental crowns have been used successfully in Clackamas cosmetic dentistry for decades. If you think a dental crown may be right for you, check with your Portland dentist. Or, if you are searching for quality dental care in the Portland area, call us here at Brookside Dental. We are located in Clackamas and have been serving the greater Clackamas area since 2011. We are currently accepting new patients at our state-of-the art, yet warm and comfortable dental office. Call us at 503-905-3380 and our friendly staff can answer any questions you have about teeth whitening in Clackamas, veneers or any other cosmetic dental, general oral health, or dental financing questions. Next Next post: It’s a great time to have ugly teeth!